It was a beautiful, starry night. The area was so peaceful and quiet. One year had passed since the Rogue Warriors returned to their planet with Simon. They were outside a house. Whilst they made barbecues, they enjoyed a show of fireworks. “Get ready, guys,” warned Simon “The fireworks are about to begin”. As Simon lit a few fireworks, the Rogue Warriors eagerly looked on. Dave continued to serve the barbecue. “Who wants hot dogs? !” he called. “Me, me, me!” said Helen eagerly. She then chowed down on them. “Whoa, take it easy, Helen! You’ll get a stomach ache again,” stated Vicky. “Ah, don’t worry about her, Vicky. She’s a growing girl,” said Charles. Simon then walked up to them. “This was a great idea to set up fireworks on a night like this” he praised. “Yeah. This is a well deserved break, after all these months of fighting Zeus” stated Chucky. “You said it, pal” praised Dave who was still making burgers. Helen then looked up whilst she ate her hot dogs. Something then distracted her from the view of the fireworks. “Hey, what is that?” she asked. “A firework going off” stated Charles. “No, that bright star” said Helen. “What bright star?” asked Vicky. “That one” said Helen as she pointed to the sky. The others then looked up and they saw a star. It got bigger and wider. “What the hell is that?” asked Dave. “It’s too big to be a star,” said Simon. The star started to close in on them. “It looks like a comet,” pondered Chucky. It then entered the atmosphere as it closed in towards their direction. The comet then flew passed their heads and crash-landed nearby. “What the Hell was that? !” asked Dave in shock. “I don’t know,” pondered Simon. “Let’s go and check it out,” suggested Chucky. They headed off to find the crash site. Charles managed to find the crash site. “Hey guys, I found it” he called. The others caught up to him. They are all then shocked to find that the crash site was a small spaceship of some sort. “What is it?” asked Helen. The ship door then opened. A few seconds later, two humanoid girls came out and collapsed on the floor and were unconscious. One of the girls was in her early teens. She was wearing a gold top and a medium sized, black skirt. She had two arms and legs. She was wearing a bracelet on her left wrist and she had short, wavy hair. The other girl was in her late teens. She was wearing a purple top and blue jeans. She had two arms and legs. She was wearing a bracelet on her right wrist and she had long straight hair that reached down to her waist. “Oh my god” said Vicky with shock. Simon and Chucky helped the girls up. “Lets get them inside, quickly” suggested Charles. They all brought the two girls inside the house. After about thirty minutes, the girls awoke from their slumber and found themselves in two separate beds. “Hey guys, they’re waking up,” called Vicky. The others rushed up to see the girls. “Where are we?” asked one of the girls. “Don’t worry, we found you after your ship crashed nearby” stated Helen. “You’ve both been unconscious for about half an hour,” stated Chucky. “Who are you creatures?” asked the other girl. Simon and the Rogue Warriors introduce themselves by their names. “I’m Cathy,” said the young girl. “And, I’m Carol” said the older girl. “Pleased to meet you both” said Charles. “We don’t mean to be rude or anything, but we must leave” said Cathy. “We need to fix our ship and get off this planet as soon as we can,” stated Carol. “We salvaged as much as we could from it, but I’m afraid it’s too badly damaged in the crash,” explained Chucky. Cathy and Carol then paused for a moment. “Are you saying we’re stuck here?” asked Cathy fearfully. “I’m afraid so” said Chucky. Cathy and Carol both felt saddened from the situation. “Hold on! Why do you two want to get of this planet so quickly?” he asked cautiously. “Yeah, what seems to be the problem?” asked Vicky. “The entire universe is in danger! An evil alien race known as the Metrolians is storming through the reaches of space and conquering every planet they come across,” stated Cathy. “What are Metrolians?” asked Helen. “They are a viscous race that has no love for other cultures. They wish to take control of the entire universe and reduce everyone to slaves,” explained Carol. “Reduce everyone to slaves?” asked Chucky in shock. “Yes. Our people have been fighting them for centuries, but now we’ve…” stated Cathy as she began to be a bit tearful. Carol then comforted Cathy as she cried. Simon and the Rogue Warriors felt saddened from the situation. “Don’t worry. We’ll help you as much as we can” assured Charles. “How can you help us? We don’t even know any of you people!” stated Carol tearfully. “Because we are the Rogue Warriors” posed Dave. 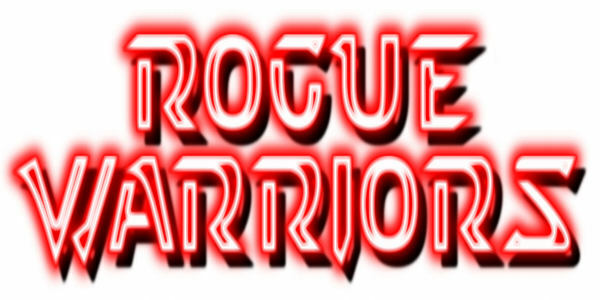 “Rogue Warriors?” said Cathy confusingly as she wiped away her tears. “Yep. We fight for the good of our people around the world,” explained Charles. Suddenly, an explosion occurred outside. They all went outside to check it out. A Few seconds later, a large spaceship entered the planet’s atmosphere. “WHAT THE HELL IS THAT?! !” yelled Dave. “Is that one of Zeus’s new inventions?” asked Simon. Carol and Cathy looked terrified. “It’s a Metrolian troop transport ship,” said Cathy fearfully. “Are you saying that’s an invasion fleet?” asked Vicky. “They’ve come to conquer this planet,” stated Carol. “Dave, grab your weapons and lets give them a warm greeting. The rest of you, stay here with Cathy and Carol” ordered Charles. Dave grabbed his equipment and headed to the transport ship with Charles. The others headed back indoors. “How many Metrolian soldiers are inside that ship?” asked Vicky. “I hope those two will be ok,” said Cathy worryingly. “Don’t worry. If they need help, they’ll contact us on their communicators” stated Simon. Charles and Dave rushed towards the transport ship and are shocked to find that it has landed outside Zeus’s factory. “Why has the ship landed there?” asked Dave. “I don’t know. I hope that Zeus isn’t in league with them,” pondered Charles. “Well it won’t be the first time he tried this manoeuvre. You remember the war with America last year?” asked Dave. “Well, it’s not like of Zeus to make contact with alien species,” stated Charles. “Lets just go in and destroy that ship,” said Dave impatiently. They both charged at the ship and suddenly stopped in their tracks as the bay doors opened. A few Metrolian troops emerged from the ship. They all had bulk, upper bodies. They had two arms and legs and a large gun was imbedded in their right arms. They were bald and they had cybernetic implants in their heads. “These must be the Metrolians, Cathy and Carol mentioned,” stated Charles fearfully. “They’re… they’re hideous!” said Dave with shock. A large and more powerful Metrolian then stepped outside the ship. “Sweep the area and prepare to build a base camp. If you encounter any aliens, bring them here for abduction and questioning. If you find any that resist, eliminate them,” ordered the Metrolian. “Yes, sir!” said the troopers as they began to search the area. Charles and Dave then crept closer to the ship. “We better try and destroy the ship from the inside out” suggested Charles. “What if they are working with Zeus?” asked Dave. “Well, you better find that out. One of those Metrolian trooper’s heading for his factory” stated Charles. “What are you going to do?” asked Dave. “I’m going inside to destroy their ship. I’ll contact the others if I need help” explained Charles. “Good luck, Charles” said Dave as he headed for Zeus’s factory. Charles then snuck round the Metrolian General and got inside the ship. Zeus worked on his computer. His doorbell then rang. He got up to answer it. Dave was at the door. “Dave? What are you doing here?” asked Zeus angrily. “No time to explain, professor! Aliens are invading our planet,” explained Dave. “Aliens? I was unaware of any alien invasion,” stated Zeus. “Well, take a look outside. They landed in front of your factory,” explained Dave. Zeus took a look and then was shocked. “Whoa! When did they arrive?” asked Zeus. “Only a few minutes ago” said Dave. Dave then thought for a moment. “You weren’t expecting them, were you?” asked Dave cautiously. “Of course I wasn’t! Do you really think that I would like aliens to come and kill me?” asked Zeus angrily. Just then, laser shots were fired at them. Dave and Zeus took cover inside. A Metrolian trooper approached the factory and blew down the door. Zeus was cowering behind Dave in a corner. The Metrolian trooper approached them. “Who are you and what do you want?” asked Dave angrily. “I am a trooper of the great Metrolian Empire! You two will now surrender yourselves to me or I’ll eliminate you!” ordered the trooper. “Is that supposed to be intimidating? Because you don’t scare me,” stated Dave angrily. Dave then charged to fight the trooper. The trooper suddenly knocked Dave out with one punch. Zeus was now petrified. The trooper turned to him. “I shall now eliminate both of you for your insolence,” stated the trooper angrily. He the raised his gun at Zeus and was ready to fire. “God help me,” said Zeus in great fear.